But there she was, staring out of her cage from the adoption center at Petsmart. Pale blue eyes blinking sleepily, delicate paws batting through the bars, and sharp little teeth nibbling on my fingers. I was only there to pick up food for my two black Shorthairs (Toby and Gideon) and my rescue tabby (Mouse) and stopped into the adoption area just to spend a couple minutes playing with the rescues. We had reached our 'limit' of three cats a few years before and really weren't planning on adding to our cat family until the inevitable occurred - hopefully in the distant future - but there she was and she grabbed my heart. I mentioned her to my husband and he said what I expected - "we don't need another cat". But a couple weeks later I had to replace some cat fountain filters ... and the filter display is right next to the adoption center ... and there she still was, sitting on her box and staring out at me. 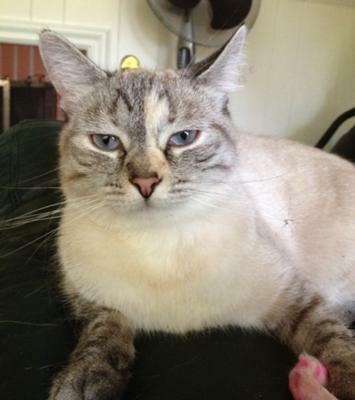 Unbelievable, that no one had adopted this sweet, gentle kitty! So I took a picture and texted him again. "She's still here." "That's nice", he replied. "She'll find a good home." Well, a week later when we returned from our Memorial Day vacation, she was still waiting for me, and after some pleading and coaxing, she DID find a good home - with US. And within 24 hours we were a big happy family of four cats. Stella (I'm a big Tennessee Williams fan and love hollering "Stelllll-aaaa" to get her to come running through the house!) has made her place here, chasing and being chased by the boys and respectfully cuddling around the matriarch Mouse. 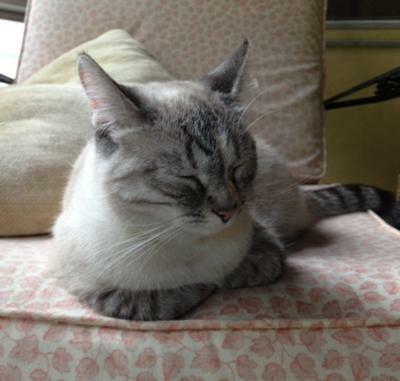 We're looking forward to years of laughs and snuggles with this exotic lynx-tortie point Siamese-ish kitty! What a sweetheart! I can completely understand why you fell for her. 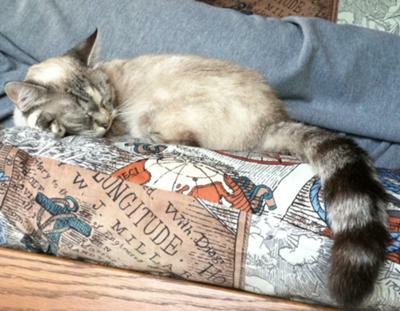 Yes, she's a lynx-tortie Siamese mix, and what an amazing tail she has. It's great that she gets on so well with your three other cats, as sometimes it can take a while for rescues to settle in, especially into a house where there's an established hierarchy. Lucky Stella! I hope you have lots of fun with her for many years to come. What a beautiful girl! 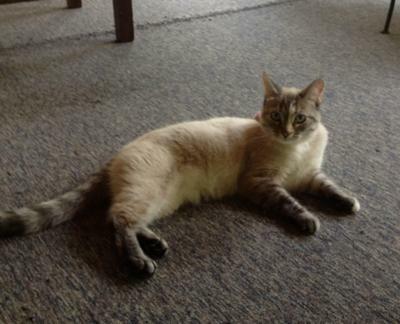 We have a boy (Sanskrit) who looks very similar to her that we adopted from PetSmart as well! He is such a little charmer and sweetheart too! :) Congratulations on your darling addition!